STATE COLLEGE, PA — For people who are sick of the cold and snow and hoping for a quick end to winter, AccuWeather.com Chief Long Range Forecaster Joe Bastardi may have bad news. More persistent cold is expected to hold strong through at least the middle of February across much of the eastern two-thirds of the country. Bastardi also expects wintry events to last into April in some areas, which would be longer than last year. Based on what is predicted for the rest of the season, Bastardi also says that this winter could end up being the coldest for the nation as a whole since the 1980s. While cold weather is of course a part of winter, the persistent nature of colder-than-normal conditions and a lack of brief warm spells people can typically look forward to during midwinter have been unusual this season. Temperatures since Dec. 1, 2010 have averaged below normal from Boston and New York City to Chicago, Minneapolis, New Orleans, Atlanta and even Miami. Temperatures are expected to continue averaging below normal in many of these places, from the northern and central Plains into the East, through at least the middle of February. The biggest snowstorms in February will target areas mainly north of a line running from the Mason-Dixon Line to the Ohio River and I-40 across the Plains, according to Bastardi. Just to the south of this line (from Amarillo, Texas to about Atlantic City, N.J.) is where Bastardi expects storms to vary between producing snow, ice and rain for the bulk of the rest of the winter. It will not be until late February into March that opportunities arise for the colder-than-normal weather pattern to break. However, Bastardi warns that there could be a return of cold and storms across the northern part of the nation, including the Great Lakes and Northeast, from mid- or late March into April. He says this will be quite a change for the Great Lakes and Northeast as compared to last year, when the regions experienced their warmest back-to-back March and April on record. He adds that late-season winter storms in the Plains and East are common during La Niñas, when sea surface temperatures across the equatorial central and eastern Pacific are below normal. Bastardi says the current La Niña could continue into next year. Bastardi says La Niñas also tend to "conjure up a more intense severe weather season," which typically ramps up in April into May from the southern Plains to the Great Lakes, mid-Atlantic and Southeast. Above-normal warmth recently established in the interior Southwest is expected to generally persist through February and, in some areas, through March and April. Bastardi says this warmth should also spread into Texas. That is not to say that there will not be periods of chillier weather for the Southwest and Texas, however. In fact, temperatures are expected to average out near if not below normal much of next week. While cold air stays focused over the eastern two-thirds of the country through at least the middle of February, temperatures across much of the interior West are expected to be above normal. This will be due to the position of the jet stream over the western coast of North America being well north over British Columbia during this time. Changes may start taking place for the region late in February, with a transition to below-normal temperatures in the Northwest and northern Rockies following throughout much of March. Precipitation has been above normal across much of the Northwest this season so far. Overall, Bastardi expects the region to remain above average in terms of precipitation throughout the rest of the winter with more snow and ice across the interior and mostly rain west of the Cascades. For Southern California, which was hit with epic rain and flooding in December, drier-than-normal conditions have set in since the start of the year. 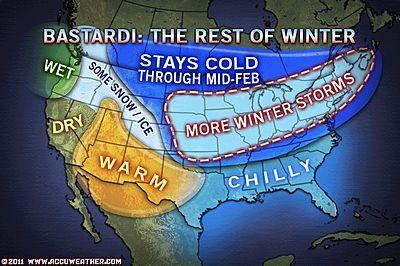 Bastardi says that precipitation should average out below normal there for the remainder of the winter. Story by Heather Buchman, Meteorologist for AccuWeather.com.